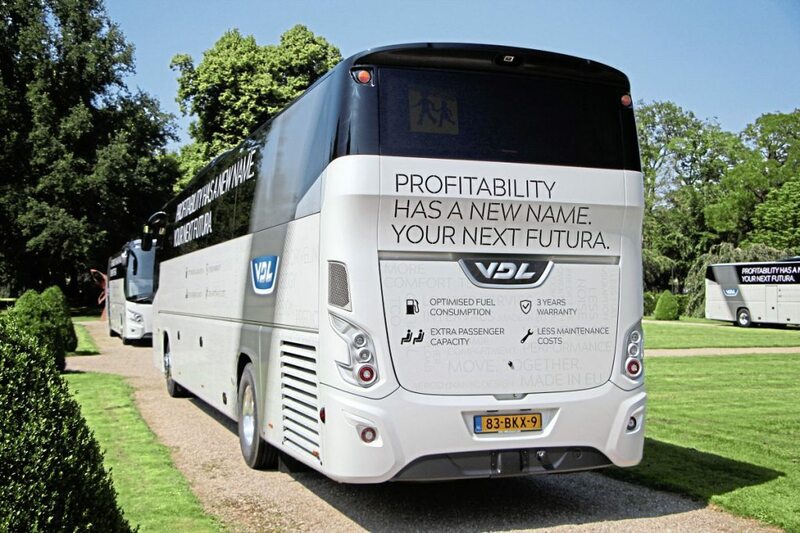 VDL has announced a major upgrade of the Futura 2 family with a new driveline, reduced weight and the promise of a reduced total cost of ownership (TCO). Launched in 2010 in left-hand drive, and in early 2012 in right-hand drive, the Futura 2 family had a hard act to follow – few coach designs stay in production for 31 years as did the Futura Classic. As with the original Futura, there have been updates along the way to cope with developments such as the launch of Euro VI, as well as the extension of the range to include the mid-height MD2 and the double-deck DD2. With 3,500 examples built so far, there is now a new round of improvements to announce although the distinctive Futura 2 look remains almost exactly as it was. To achieve the various improvements they worked in close cooperation with both DAF and ZF, reflected in both companies being invited to make presentations during the launch. DAF supplies the MX11 engine and ZF the axles and the automated TraXon gearbox, with the fully automatic EcoLife/EcoLife Coach now an option in all Futuras. Together, the three manufacturers sought to reduce the total cost of ownership for operators, particularly with regard to fuel, oil and repair and maintenance. 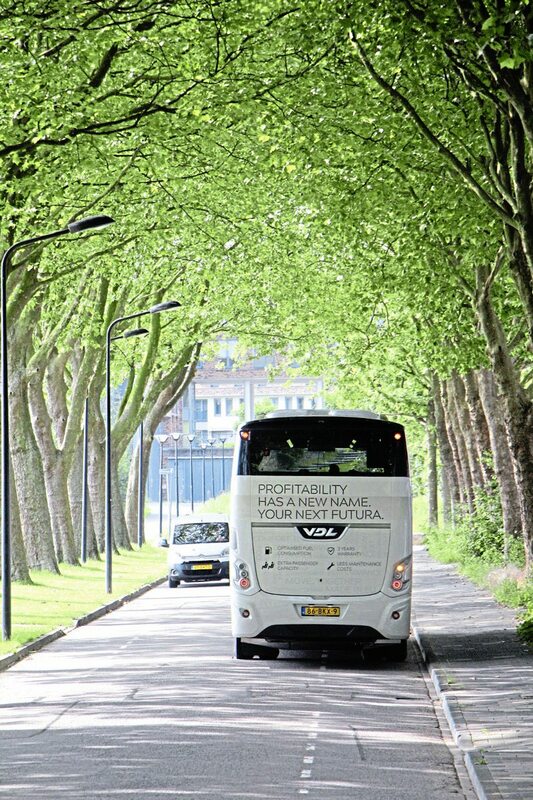 As a result of their combined efforts, VDL claim the new driveline results in 3% lower fuel consumption and that this can be increased by up to another 2.5% (making a total of 5.5%) if the Predictive Powertrain Control (PPC) feature is specified. 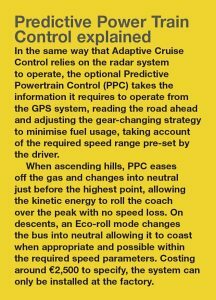 PPC uses GPS to determine the topography ahead and adjust the performance of the drive-train accordingly. Simplifying maintenance, MX11 engine service intervals have been extended from 75,000km to 100,000km and, on high mileage work, it is possible to take this to up from 100,000km to 150,000km. Access to engine components has been optimised by measures including a redesign of the engine bay and the relocation of the cooling system to the continental offside which together can reduce R&M costs by up to 6%, VDL claim. UK operators probably won’t welcome the relocation of the cooling as this will place it on the UK nearside, where it will be more exposed to dust and debris in gutters, but they will appreciate the new three year/300,000km full warranty. VDL has always offered the 10.8-litre Paccar/DAF MX11 unit in the single-deck Futura coach range and previously offered the 12.8-litre MX13 in some models. 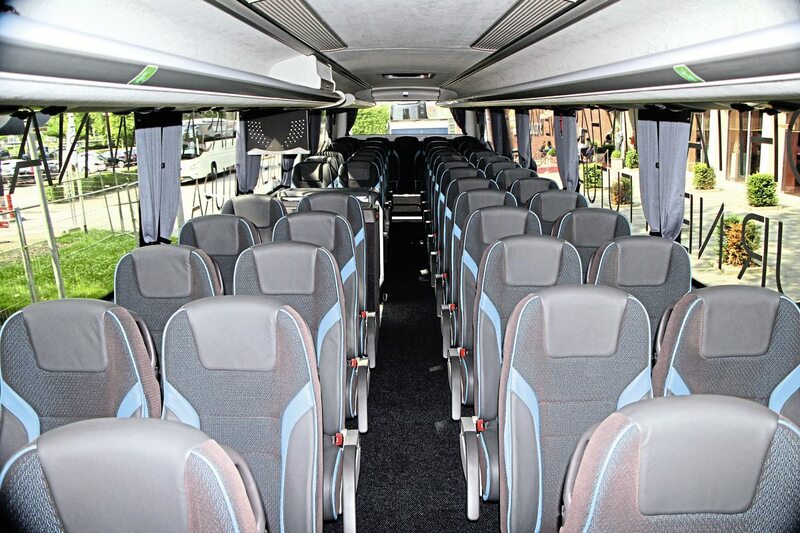 With the arrival of the latest MX11 offering increased torque, it has taken the decision to switch to exclusively offering this unit in its single-deck coach family. It is also making it an option in the Futura DD where the MX13 remains the standard. controlled, single-stage (VTG) turbo charging system, electronically driven crankcase ventilation and an SCR/DPF exhaust after-treatment module as well as EGR technology. Most of the major components have been completely redesigned, among them the block, cooling, bearings, air inlet and pistons, and the compression ratio has been increased with a more efficient turbo added. Friction within the engine has been cut. Reducing engine load and saving fuel, the oil, water and power steering pumps now only engage when needed. One of the attributes of the new unit is that the peak power output is now achieved at low revs – only 900rpm – and all deliver at least 50Nm more torque; some models adding 300Nm. This down-speeding in conjunction with the TraXon gearbox and a rear axle ratio that is now 1:2.71 as standard, enables the revs to be reduced by as much as 100rpm at cruising speeds. This helps play a part in a 3% reduction in fuel usage. Two-axle versions of the Futura FHD and the lower height Futura FMD will have the MX11.270 delivering 367hp/270kW at 1,600rpm and torque of 1,900Nm at 900-1,125rpm as standard, giving a torque increase of 300Nm over the previous generation. Three-axle versions have the MX11-300 delivering 410hp/300kW and peak torque of 2,100Nm. The more powerful MX11-330 which provides 450hp/330kW and torque of 2,300Nm can be specified in all three axle models (including the FDD2) as well as two axle FHD2s. 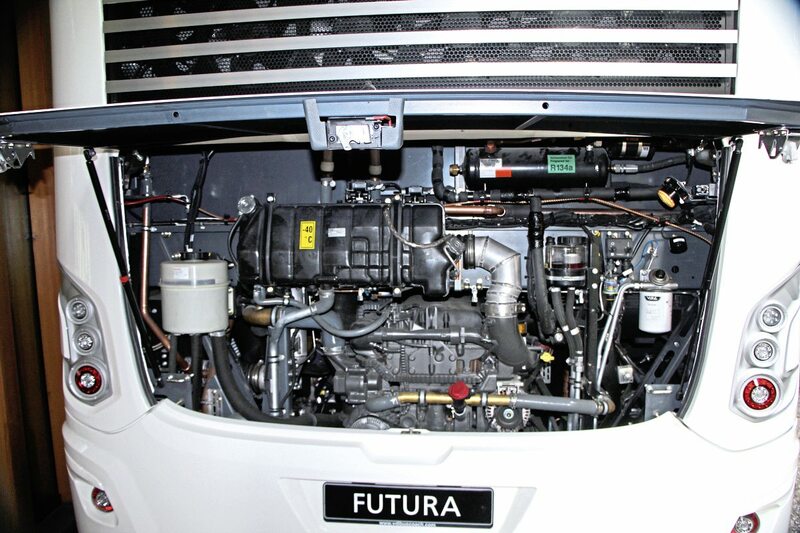 Around half of the 100kg weight saving achieved in the latest Futura comes from the completely redesigned EAS (exhaust after-treatment system) unit, which is 40% smaller than the previous one and weighs 120kg rather than 170kg. It uses less fuel than currently because the regeneration interval has been extended. A significant benefit is that all of the weight saved is beyond the rear axle, reducing the rear axle loading and enabling weight to be better distributed throughout the coach. 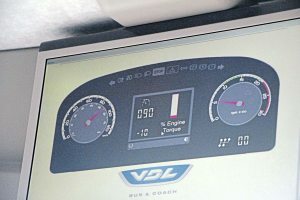 Furthermore, the service interval is now 500,000km with the former three year limit stipulation removed, which VDL claims represents a €750 saving. Providing retardation in addition to the foundation brakes and the ZF intarder is the MX Engine Brake (also known as the DEB – DAF Engine Brake). This compression brake is activated using the stalk to the right of the steering wheel, reducing wear on the service brakes. The previous maximum braking effort of 320kW has been increased to 340kW with the MX11 engine and braking power between 1,000rpm and 1,500rpm is increased by 20%. The higher the rpm is, the harder it brakes. The unit additionally assists the TraXon to change gears more swiftly by reducing the engine speed more quickly. The engine itself has a dry weight of 1,015kg and DAF claim it will be more reliable than the previous generation. 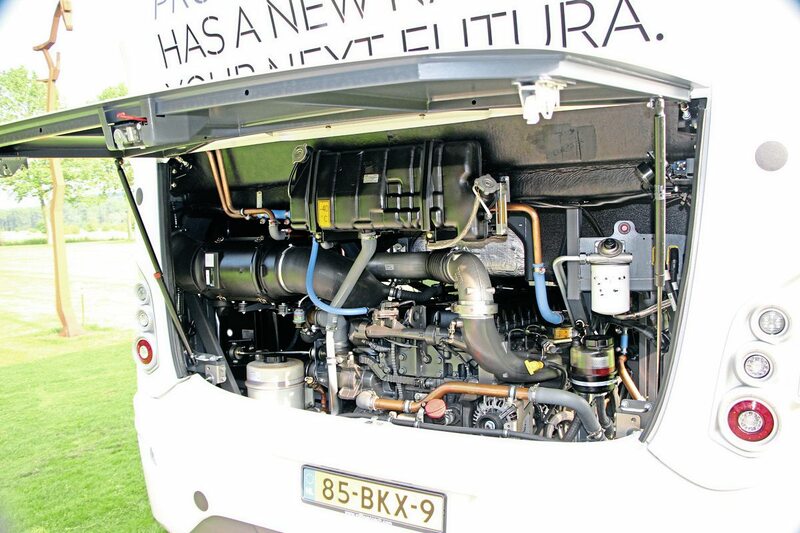 It can run on HVO fuel which gives a CO2 reduction of 80%. Standard in the Futura from now on will be the ZF TraXon automated manual gearbox, which is replacing the previous ZF AS-Tronic unit that many readers will be familiar with. The change follows several years of extensive testing and honing by the manufacturers. For the first time, a manual option is not being offered, presumably reflecting the demand for it. 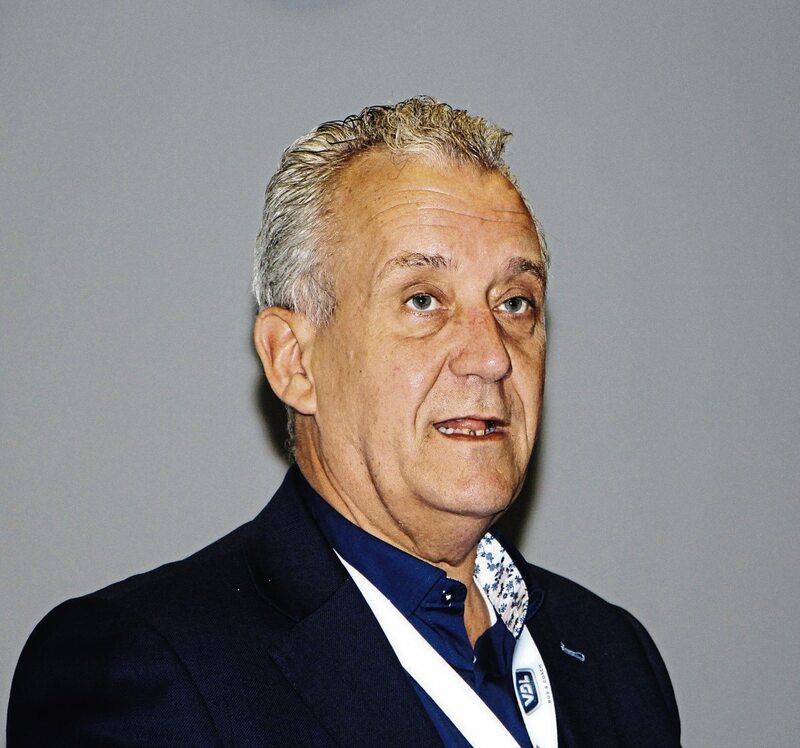 Ralf Weber of ZF emphasised that TraXon was not a development of AS-Tronic but a new ground-up development that had first been launched for trucks in 2015. 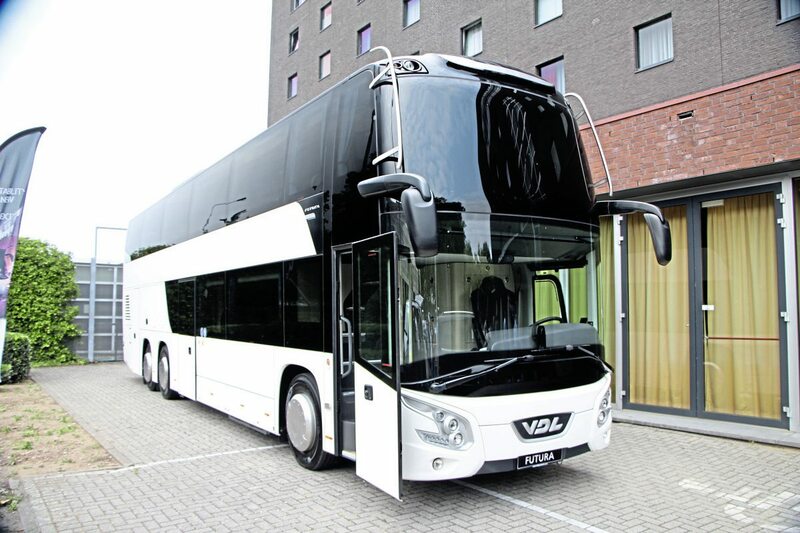 VDL has been the pilot customer for TraXon in coach, with full roll-out coming in September. Compared with the AS-Tronic, it offers improved fuel saving through better efficiency, cutting-edge software functionalities, quieter operation, enhanced torque/weight ratio and a longer and more reliable service life. 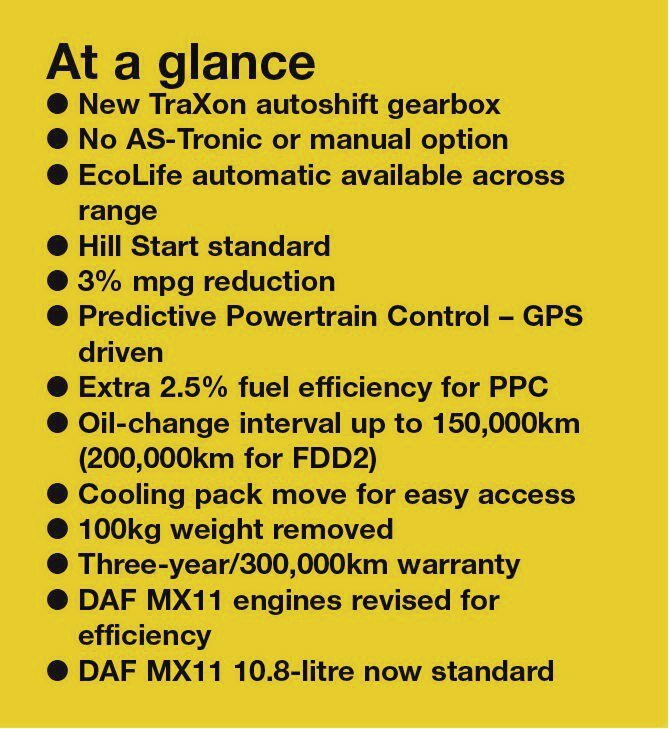 On this latter point, TraXon is designed to make 50% more clutch operations and 66% more gearchanges than ZF AS-Tronic. Mechanical efficiency is an impressive 99.7%, an improvement of 5% and it enables engine rpm to be reduced at cruising speed. It can cope with higher input torques of up to 2,800Nm and is 20kg lighter than the previous transmission. Benefiting fuel economy are new software functions designed to ensure the engine enjoys optimised operating conditions. Faster gear changes are accomplished by means of minimised shifting times, an adapted driving strategy and redesigned gear-change sequences to cope with more exacting terrain. With the reduced time taken to change, the engine has less opportunity to lose power making the process and the ride smoother and well as increasing acceleration times with no loss of comfort. This speedier shifting has been accomplished by more accurate sensors which can determine more precisely when a change should take place. There is a ‘hill start’ which will hold the coach for five seconds, when pulling away on an incline and a manoeuvring mode makes manoeuvring in tight, slow-speed, situations easier. amount of torque available when they are travelling in top gear. With the Futura, we were told that 100% of the torque is always available. Also available as an option now on all variants of the Futura is the fully automatic ZF EcoLife or EcoLife Coach gearbox, full details of which were covered in our recent report from ZF’s Friedrichshafen headquarters. VDL’s double-deck design, the Futura FDD2, continues to be offered with the 12.8-litre MX13 engine as standard, the unit being the DAF MX13-390 with huge figures of 530hp/390kW and peak torque of no less than 2,600Nm. 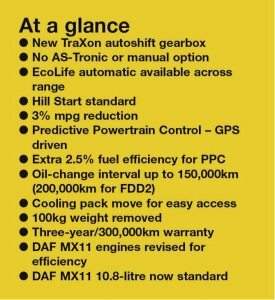 To cope with all of that torque, the gearbox is the new automated TraXon 12TX2811BO which is capable of handling up to 2,800Nm. Oil change intervals are up from 90,000km to 100,000km and can be up to 200,000km (from 100,000km) on long-distance work. 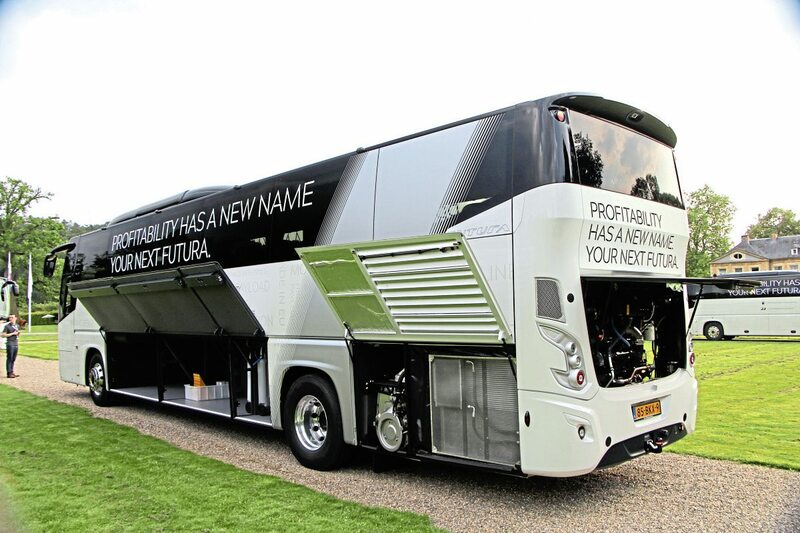 For the first time, customers for the double deck FHD2 will also be able to specify an automatic option instead of an automated manual, in this case the new EcoLife Coach unit on which B&CB recently reported. This can cope with torque of up to 2,300Nm and is being offered in conjunction with the 450hp variant of the DAF MX11 engine. VDL claims: ‘This combination is ideal for line service and regional transport as well as for providing intercity connections.’ One of the new FDD2s was present but as it has yet to be homologated we were not able to ride on it or drive it. With the MX13 engine, the MX Engine Brake gives a 30% increase in braking power between 1,200rpm and 1,500rpm and maximum braking output of 360kW. 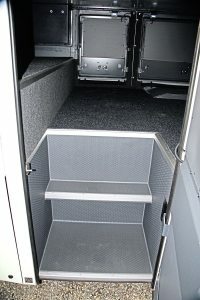 Along with the driveline changes, the opportunity has been taken to address an existing criticism of the FDD2, that access to the luggage compartment was poor. 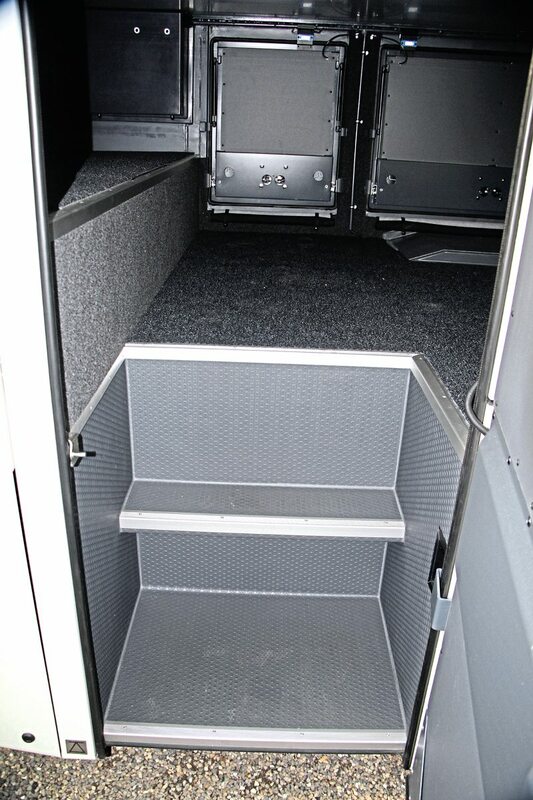 On the latest version, the full-height door opens to reveal steps into the hold, making loading considerably easier. 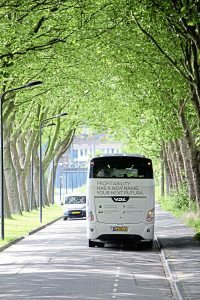 For on-road experience of the new driveline, VDL brought together six nominally identical 12.9m Futura FHD2s in special promotional liveries for the demonstration duties they will take up following the launch event. Each was destined for a different market, so the Spanish one had a glazed screen behind the driver and the Polish one did not have a satellite navigation system but all had identical drivelines featuring the 450hp/330kW DAF/Paccar MX11 engine and the ZF TraXon 12TX2411BO automated manual transmission. As there were no right-hand drive examples present and no UK demonstration coach is planned at present, I was allocated to a German specification coach. My Romanian Coach of the Year Jury colleague, Cristiana Sandulescu, provided feedback on the driving. An excellent route was devised that started from the hotel in Maastricht, travelled along the A79 motorway towards Heerlen, then doubled back before travelling through the tourist town of Valkenburg and up one of the steepest hills in the Netherlands, the Cauberg, famed as the finish of the Amstel Gold Race biking event which reaches a heady (for the Netherlands) 141m above sea level. Cristiana confirmed the attributes we already know from the Futura FHD2, the excellent vision afforded by the A-pillar being so far back, the coverage of the mirrors, good ride, and helped by the low overall weight, and light but responsive steering. Before she had taken the wheel, our German colleagues had confirmed the swiftness of the gear changes, expressing surprise at just how rapid they were. ZF had told us that TraXon was 35% quieter than AS Tronic with gear-changing also notably quieter and it certainly was quiet. With the new set-up she found the acceleration was very smooth and immediate. In typical DAF fashion, the torque comes in low down the rev range. Depending on the acceleration, upward gear-changes usually occurred at around 1,150-1,200rpm, and it will change at very low revs. Once the up-shift has been made, the revs are around 1,000rpm. At 95kph in 12th it was recording 1,050rpm and at 100kph it had only reached 1,090rpm which is less than the previous MX unit and lower than, for example, the latest Tourismo. To use the PPC you also need to set the speed parameters within which you want it to operate using the centre of three buttons on the right of the steering wheel centre. The system will only let you set plus or minus the same number; you can’t set +10/-5kph for example. Journalists were asked to set the system to 90kph +/-10kph in order to best demonstrate the system’s capabilities, though in practice a driver would normally set it to 95kph +/-5kph if conditions allowed it. You can choose not to use it at all, which means that anybody installing the system has an education programme to undertake to ensure drivers make the best of the additional investment. When operating, the system decides whether to use the retarder, or only the engine brake depending on the situation. 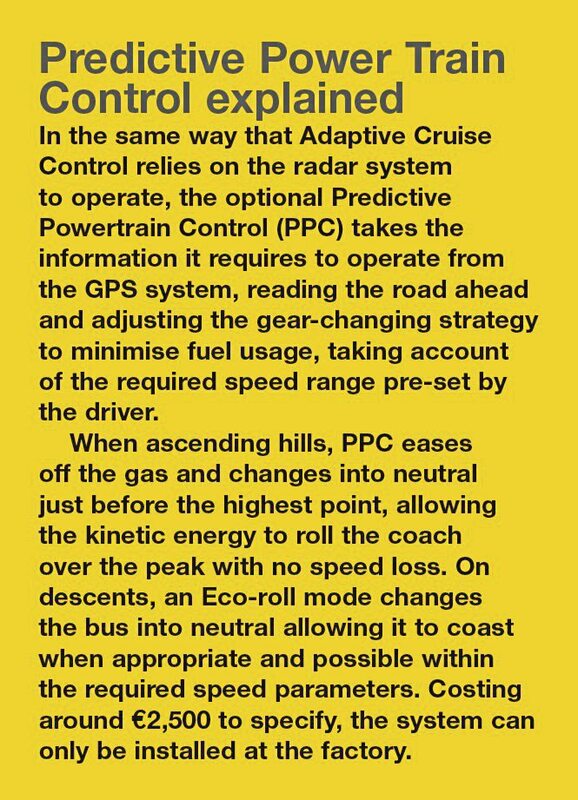 When using Predictive Power Train Control when the cruise control is not activated, the shifting strategy still functions and so does the rolling function providing the coach is in tenth gear or higher and travelling at over 60kph. Sometimes, when the vehicle is descending a hill the rolling function does not activate because the system has calculated that there is a hill coming and if it did so it would need to brake again soon after, so it looks to fuel use and remains as it was. At one point, we descended a long though not particularly steep incline on the A79 and the rolling function remained active for over two minutes, powered by the weight and momentum of the coach, before the speed dropped to the extent that it went outside the parameters set by the driver and it changed back into gear. When in rolling mode the engine is turning at 550rpm. In the past, the Futura did not offer a creep function for traffic, now it does. The first time you put it into drive mode it does not activate, but once you have engaged the clutch once (and it has determined that you are a human driving it) it will creep when you have your foot off the brake. This worked well. ‘I loved this drive, so relaxed’, said Cristiana afterwards. It is entirely undetectable when driving or travelling on a Futura, but a new feature whereby the body automatically lowers by 2cm at 90kmh will contribute to fuel savings through reduced drag. Once the speed drops below 70kmh the body rises again. Production of the new models started this week at Valkenswaard and all coaches built from now on will be to the new specifications, though all countries will have stock vehicles to work through. 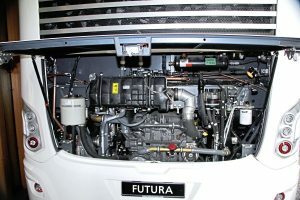 Futura has moved up market since the first vehicles were built under the Bova name and VDL now looks to compete in the premium sector. The latest changes further strengthen the brand’s credentials and show the company’s long term commitment to enhancing the appeal of operators and their customers.